Harvey's Point hotel in County Donegal has been sold for an undisclosed sum. 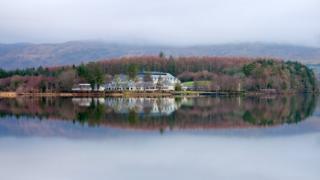 The hotel, on the shores of Lough Eske, has been owned by hoteliers Deirdre McGlone and Marc Gysling since it opened in 1989, but is now being purchased by a fund managed by Davy Real Estate. The couple said it was time to spend more time with their young family. Ms McGlone said it is time for someone else "to write the next chapter of the Harvey's Point story." Mr Gysling said the new owner is "highly experienced in the international luxury hotel and travel market and has exciting plans for the expansion of the hotel, working alongside the current experienced and loyal team." The four star hotel is located 6kms from Donegal town and has 77 bedrooms. It employs more than 150 staff, all of whom will be unaffected by the sale. Ms McGlone said it was great to know "further investment is planned and it will be exciting to see these new plans take place." She added:" The Gysling Family has brought the business as far as we feel we want to, and the main reason that we are stepping back is so that we can spend more time together as a family. It is simply a 'life-changing, lifestyle choice'. " Harvey's Point has been named TripAdvisor 'No 1 Hotel in Ireland' on six occasions since 2013.